The MSE Equity Total Return Index further extended its positive run to four straight weeks, as it posted a gain of 0.4 per cent, to reach 8,947.324 points. In total, 18 equities were active, of which gainers amounted to nine, and fallers totalled six securities. Activity in the equity market was much higher than the previous week, as a turnover of €2.71 million was generated over 169 deals, double the previous figure of €1.35 million. One of the main drivers of this positive performance was International Hotel Investments plc, which traded somewhat heavily, as 22 trades of a combined 212,906 shares were exchanged. As a result, the equity hiked a substantial 5.74 per cent over the week. At one point, the share price reached a 4-month high of €0.650, before marginally retreating to close at €0.645. The operator in the food and beverage sector Simonds Farsons Cisk plc, was a contributor in lifting the index higher as it fully recovered the previous week’s loss with a 4.38 per cent gain in value to the price level of €8.35. Turnover amounted to €25,850, across two transactions. The banking industry was a drag on the index, as the only two equities to record a price movement, traded lower. In an eventful week, Bank of Valletta plc (BOV) lost 1.56 per cent in value, closing at €1.26, having traded at low of €1.24. The equity traded heavily as 300,241 shares changed hands across 56 deals. After the market closed on Thursday, BOV issued a statement to clarify what had happened with regards to the cyber-attack which affected the bank’s operations last week, and how it is handling the situation. The statement explained that during routine reconciliations, it was noticed that there were discrepancies in eleven payments amounting to €13 million, at which point the bank immediately requested the international banks involved to stop these payments. Once it became clear that the attack was systematic and sophisticated, the bank took its contingency plan to its highest level, and decided to shut down all its operations. Since then, nearly all services have now been resumed, following rigorous overnight testing of the bank’s IT systems, which were successful. International payments however are not being processed as at the time of writing, until the security of the bank’s payment channels is ascertained beyond doubt. The bank reassured the market that customer deposits and accounts were in no way affected by the cyber-attack. In an interview, Chief Business Development Officer, Mr. Kenneth Farrugia explained that recovering the €13 million is not simply a matter of asking the banks in which the funds were transferred for the money, as there are banking procedures which have to be implemented. Mr Farrugia also stated that at this stage, it is still too early to indicate if the stolen money has already been retrieved, and to identify the source of the attack. He did however confirm that the attack did not go beyond the payments process, and thus no personal data has been breached. HSBC Bank Malta plc was also active, as ten trades of 23,249 shares were registered. The equity recorded a similar performance to its peer, as the share price dropped 1.72 per cent to close at €1.71. The other active banking equity, FIMBank plc traded flat at $0.70 over two deals of 26,102 shares. Last Tuesday, the bank announced that the board is scheduled to meet on March 23 in order to consider and approve the group’s and the bank’s audited financial statements for 2018. The board will also consider the declaration of a dividend, if any, to be recommended to the Annual General Meeting. Telecommunications company, GO plc (GO) continued on a positive path, extending its positive winning streak to four weeks. The equity posted a modest gain of 0.93 per cent this week, to close at the highest closing price in over 12 years of €4.36. Trading volume amounted to 9,671 shares over ten deals. The Malta Stock Exchange announced that following the Initial Public Offering of GO’s 49 per cent shareholding of BMIT Technologies plc, the shares have now been granted admission to the Official List. Trading in this security shall commence tomorrow, February 18. 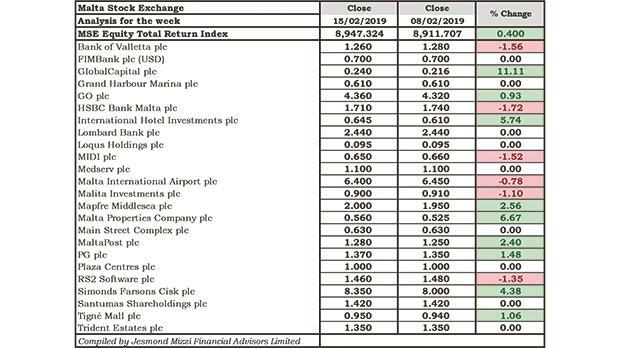 On the other hand, Malta International Airport plc broke its six-week positive streak, to post its first weekly loss in value for 2019. The share price edged 0.78 per cent, to €6.40. The equity was the most liquid last week, as an impressive turnover of almost €1.7 million was generated over 17 transactions. Conversely, a single transaction of just 2,500 MaltaPost plc shares pushed the equity 2.4 per cent higher to €1.28. On Wednesday, the company held its Annual General Meeting, during which all resolutions on the agenda, including the declaration of a final ordinary net dividend of €0.04, were approved. The best performer of the week was GlobalCapital plc, as it soared 11.11 per cent to €0.24. This however was the result of one deal worth just €456. In the same sector, Mapfre Middlesea plc climbed 2.56 per cent to €2.00 as a result of just two transactions of 10,585 shares. Last Friday, the company announced that its Annual General Meeting is scheduled to be held on April 26, 2019. In the retail sector, PG plc also recorded an increase in its share price, as it closed at the €1.37 price level. The 1.48 per cent weekly gain was the outcome of nine transactions of a combined 90,336 shares. RS2 Software plc was inactive for most of the week, before recording five deals of a combined 34,171 shares on Friday. The closing price of €1.46 translates to a loss in value of 1.35 per cent. Performance in the property sector was mixed, as gainers, fallers, and non-movers all amounted to two. The largest movement in the sector was a 6.67 per cent advancement in the price of Malta Properties Company plc to €0.56. Trading volume amounted to 73,686 shares over three deals. Tigne’ Mall plc followed suit with a modest gain of 1.06 per cent, closing at €0.95 to partially recover the previous week’s loss. A total of 29,700 shares traded across six deals. Conversely, MIDI plc retracted 1.52 per cent to settle at €0.65. The equity traded eight times as 78,360 shares changed ownership. Malita Investments plc also traded lower, as eight transactions of a combined 48,350 shares dragged the share price 1.1 per cent lower to €0.90. In the same sector, Plaza Centres plc closed unchanged at €1.00 despite generating a turnover of €27,514 over five deals. Similarly, a couple of transactions amounting to 20,502 Trident Estates plc shares had no impact on the share price of €1.35. Yields in the sovereign debt market were predominantly higher this week, as from the 21 active issues, 14 headed south and only six gained ground. Turnover totalled €2.4 million over 111 trades, considerably lower than the previous week’s figure of €4.6 million. The worst performer was the 4.3% MGS 2033 (I), as it shed 0.5 per cent in value to €134.53. On the corporate debt front, 43 securities were active, 15 of which traded higher while another ten lost ground. Turnover amounted to €2.3 million over 150 deals. The 5.1% 1923 Investments plc Unsecured € 2024 continued to trade in negative territory, as a single transaction shaved a significant 1.58 per cent off the bond price, to €102.75. At the other end of the spectrum, the 4.8% Bank of Valletta Plc Sub € 2020 recovered two weeks’ worth of losses, as it advanced 1.5 per cent to recapture the €101.50 price level.